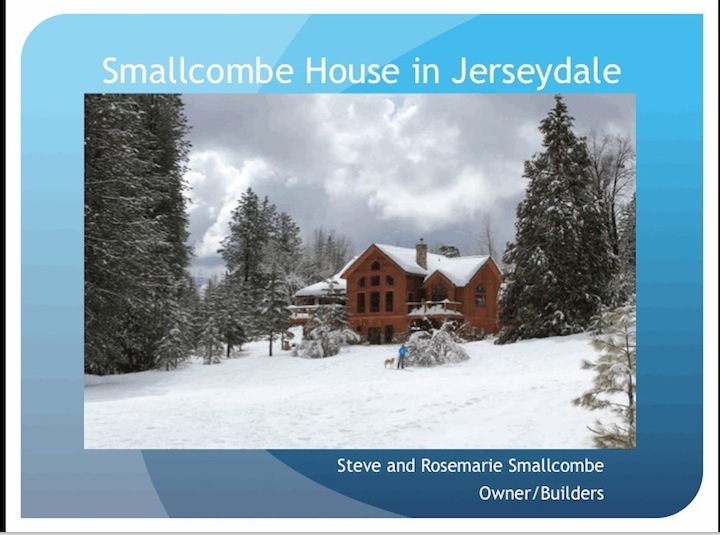 The Smallcombe home in Jerseydale is very energy efficient and, combined with the 7 kW solar array north of the house, is well on its way to yielding a net zero energy house. Or put more simply, no bills for propane or electricity to heat, cool or run the house. Read the write up below, or view the web-based presentation shown above here. The energy efficiency of the house results from five factors. First, the house was designed for this specific property to maximize not only the view of the ponds on the property and surrounding ridges, but also for energy efficiency though use of materials, orientation and placement on the property. The timber frame house has an outer envelope of Structural Insulated Panels (“SIPs”) that produce a very well insulated and airtight structure. Double pane energy efficient windows have been installed and their solar gain characteristics were evaluated and chosen to minimize solar heating on the south and west side of the house during the summer. A passive solar heated garden room is located on the southern corner of the house with window heights and roof overhangs appropriate to maximize passive solar heating in the winter and minimize solar gain during the summer. Second, the house is heated and cooled via a geothermal heat pump that uses a 3-acre pond on the property as the heat source (winter) or heat sink (summer). Measured performance last winter showed that for every 1 kW of electricity used, 6 kW of heat was extracted from the pond and distributed around the house either via radiant floor heating (preferred) or via forced air. During the summer, heat is pumped from the house into the pond and the cooled air is circulated around the house via forced air ducts. The house is divided into various zones for heating and cooling and temperatures are controlled using 13 thermostats. Considerable federal tax credits (30% uncapped) are offered for installation of geothermal heat pumps, as the federal government recognizes geothermal as the most efficient way of heating and cooling a house. While an airtight house is very good from a heating and cooling efficiency standpoint, air quality can suffer if outside and inside air are not exchanged on a regular basis. This is the job of our Energy Recovery Ventilation (“ERV”) system that allows exchange of outside and inside air while using a heat (and moisture) exchanger to recover most of the energy used to heat or cool the inside air. Third, we have installed energy efficient appliances and lighting, including extensive use of LED lighting fixtures and bulbs (there are no inefficient incandescent light bulbs in the house). Our cook top is an induction cook top manufactured by Miele. Not only is an induction cook top the most energy efficient way of cooking, our decision to purchase it eliminated any need for propane in the house. (We do have propane for our back-up generator.) All the other kitchen appliances are also produced by Miele, which markets high end products that are relatively energy efficient. Forth, electricity is generated on-site by a 7 kW solar array. The house is “all electric” in that there is no other source of heat such as propane or natural gas. Thus generation of electricity on-site is the other half of the energy efficiency/zero energy bills equation. The house is “on-grid” and so, during the winter, we do use more electricity than we generate. Our biggest electricity bill once we had our solar panels and PG&E net metering installed was $165 for February 2010 when we were also heating the motor home on the property using two electric space heaters. We were pretty much breaking even by April and May and generating a $100 plus credit per month during the late spring summer months (June and July) for electricity fed back into the grid. Thus, achieving net zero energy bills for the year seems realistic. Fifth, the climate at our elevation (3800 feet) means that, while we have some snow in the winter, the summers are relatively cool. This, combined with the design of the house, minimizes the need for air conditioning. Thus we are using electricity for heat during the winter months when electricity is less expensive (e.g. <9 cents a kW hour) and putting electricity back into the grid during the summer afternoons when electricity is worth at least 31 cents a kW hour. These five factors combine to result in a house that is not only very comfortable, but also very energy efficient and capable of putting energy back into the grid when others need it most.